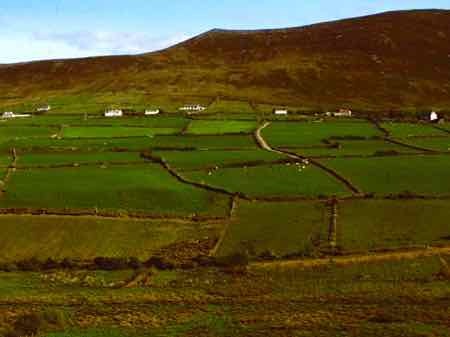 If you fly to Ireland and land in Shannon, put the Dingle Peninsula on your tourist road map. We think driving the Dingle Peninsula is a great alternative. You can start in Killarney just as you would for the Ring of Kerry. If you have enough time... drive both circuits! Before you start your drive to Dingle, you can take in the Muckross House and the Ross Castle near Killarney. 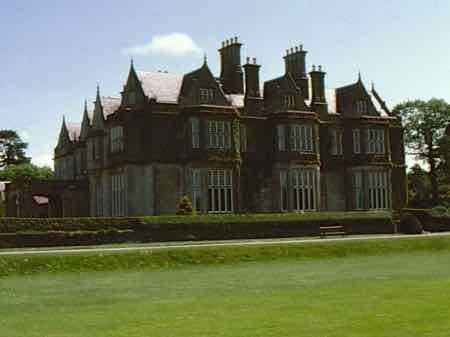 Muckross House is about 3.6 miles (6 km) from Killarney town center. It is a lovely large old Victorian manor house furnished in period style of the 19th century. There are wonderful gardens, and the site is beautifully situated in the Killarney National Park overlooking the Lakes of Killarney. Ross Castle is a typical example of the stronghold of an Irish Chieftain during the Middle Ages. It was probably built during the 1400s. It does contain some furnishings... 16th and 17th century oak furniture. Because it is close to Killarney and the Ring of Kerry, it gets very busy in the high season. 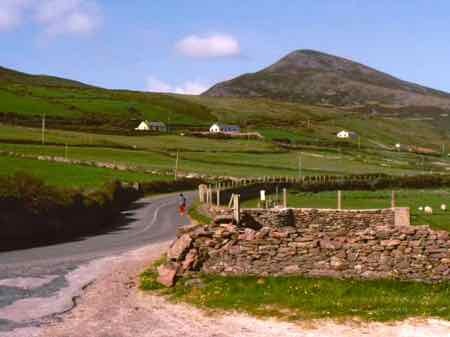 You would visit those if you were driving the Ring of Kerry, but for the Irish "country road and great scenery" experience without the crowds, head now for the Dingle Peninsula. Start by driving through the city of Tralee. It's a cute little city. You could stop here for the night or just head straight out to Dingle. You don't get much more Irish than in this area. You need to know the word "Gaeltachts". These are national parks for traditional culture... where the old Irish ways are protected, and where Irish or Gaelic is spoken. You'll have to know what you're looking for because most map names and signposts are in Gaelic.... and some even have old style lettering, so you'll have to be on your toes. ...with a population of... oh, about 2,000. There are only a few streets with houses, shops and pubs painted in happy, bright colors. It's easy to find a B-and-B here, and meals are easy to come by in pubs as well as restaurants and cafes.... and at night you will probably have the opportunity to hear traditional Irish music. Leave the little town behind for a circle drive around the end of the Dingle Peninsula. The whole area has the feel of an open air museum. There are the remains of Stone Age ring forts, and beehive huts that Monks lived in during the Dark Ages. There are rugged coastline views and tiny green pastures with sheep grazing. 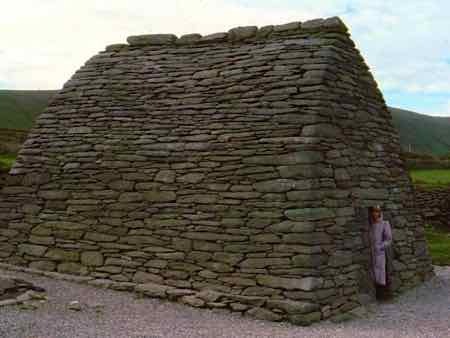 There is an ancient church called the Gallarus Oratory from about 800. That's the point in Europe closest to America before you head back to Dingle or Tralee. You can explore the peninsula by car or bike. It is only 10 miles (16 km) wide and from Tralee to Slea Head it is only 40 miles (64 km) long. The whole drive can be leisurely taken in just a few hours, but this is not an area for frenzied tourists.... it's quiet and peaceful.